The second online live action series will be available this fall online first before heading to home video. 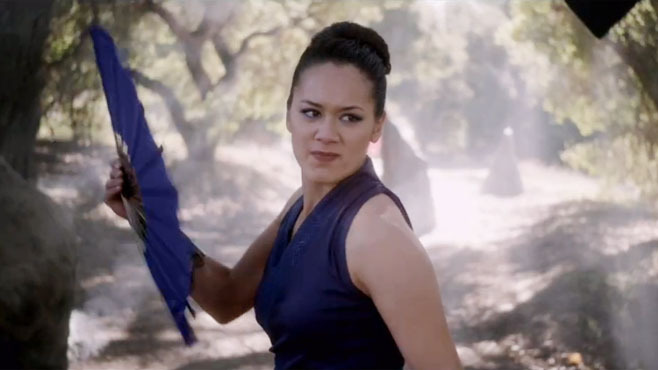 While a big screen movie is in development, Mortal Kombat is returning to the Web in a brand new second series of live action. Mortal Kombat: Legacy II will debut worldwide on Sept. 26, 2013. Produced by Warner Bros. Digital Distribution, the second series is based on the legendary Mortal Kombat video game franchise, co-created by Ed Boon, developed by NetherRealm Studios and published by Warner Bros. Interactive Entertainment. Mortal Kombat: Legacy II is directed by Kevin Tancharoen (Mortal Kombat: Legacy) and co-written by Josh Baizer and Marshall Johnson (Dead Loss). The first season of Mortal Kombat: Legacy was one of 2011’s most-viewed web series and has generated more than 70 million views to date. The series is also available on Blu-ray. In the second season, the saga continues as Liu Kang and Ermac join the ranks of fighters introduced in the series’ first season, including Kenshi, Kung Lao, Kuai Lang, Stryker, Kitana, Mileena, Johnny Cage, Scorpion and Sub- Zero. This new season uncovers the rivalries and histories of these fierce warriors as Raiden and his recruits clash against the dark forces of Outworld. Chronicling the tournament and the interweaving storylines of the most beloved Kombatants, fans also will learn of the complex relationship between Liu Kang and Kung Lao and revisit the complicated family dynamic of Kitana and Mileena. The epic battle for EarthRealm has finally begun! "Mortal Kombat Legacy: II follows the record-breaking first season of the series and treats fans to an even higher caliber of online filmmaking,” said Lance Sloane, Producer, Warner Bros.